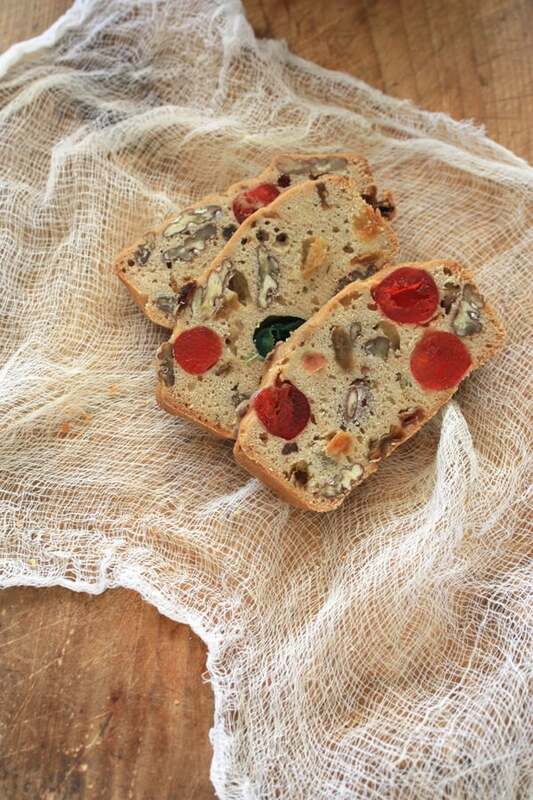 People either love fruitcake or they hate it. I happen to hate it, but I do love my mother-in-law’s recipe. 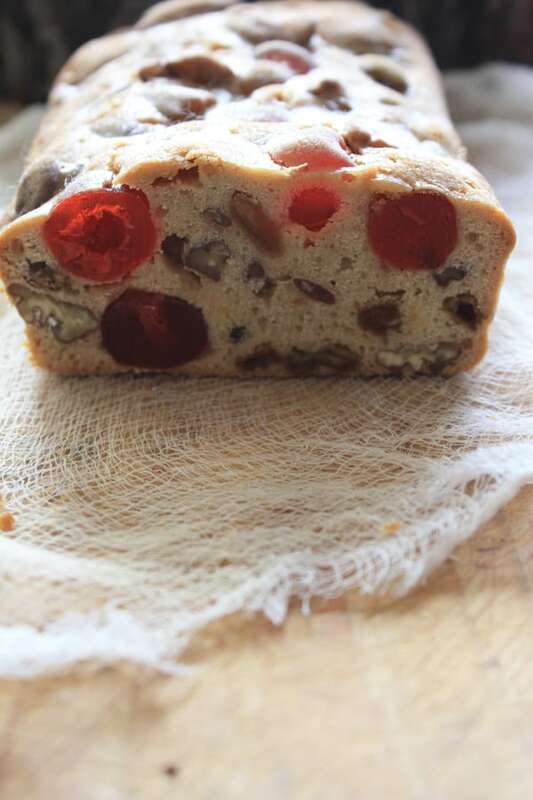 It’s more of a rum cake rather than a fruitcake — its super moist and super boozy. She makes it every year and sends us a loaf if we are not spending Christmas with them. This year we will be traveling to Idaho to spend Christmas with my in-laws and I look forward to eating this cake with her. My hubby and I have been together for over 12 years and when we spend the holidays with his side of the family for Christmas it is very different than the Christmas’ we celebrate with my side of the family. My side of the family usually gets together on Christmas Eve (Noche Buena) and we eat a casual potluck-style dinner with my large extended family and our friends, and then Christmas Day, we spend it with our immediate family. With my in-laws they do not celebrate until Christmas Day and the menu is similar to a formal Thanksgiving dinner. I don’t mind that, but I do miss Mexican staples such as tamales and menudo. 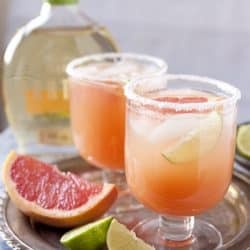 Every time we celebrate with them I try to introduce them to traditional Mexican Christmas dishes, and now they even request some of their new favorites such as chile con queso, shrimp cocktail, and ponche navideño. I’m looking forward to Christmas vacation and snuggling with my kiddos as we watch Christmas movies. 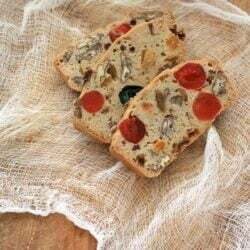 I especially look forward to relaxing near the crackling fireplace and eating a moist slice of this fruitcake and drinking a hot cup of spiked ponche. It’s a little bit of Christmas heaven. My mother-in-law has been making this Christmas fruitcake for over 40 years. 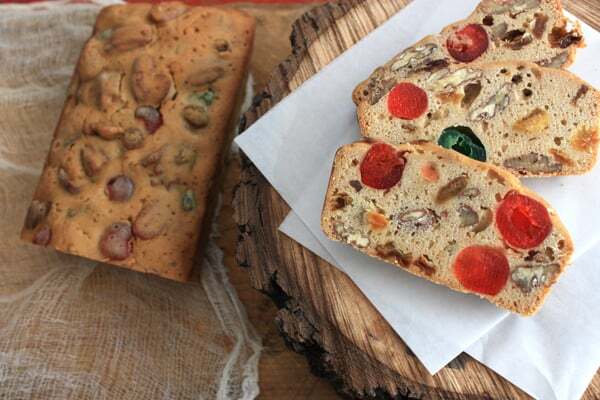 Many shy away from fruitcake, but not this one. This one is marinated in bourbon for weeks before Christmas, making this a very delectable and special cake. I swear, the longer this cake sits, the better it tastes and it makes great Christmas gifts. Combine cherries, raisins, and bourbon in a large mixing bowl. 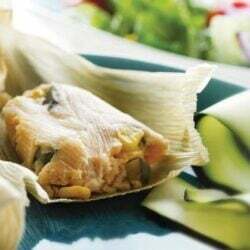 Cover tightly and let stand in the refrigerator overnight. Drain fruits and reserve bourbon. Place butter in the large bowl of an electric mixer and beat on medium speed until light and fluffy. Add sugars gradually, beating on medium speed until well blended. Add egg yolks, beating until well blended. Combine ½ cup of the flour with pecans. Sift the remaining flour with the baking powder, salt, and nutmeg. Add 2 cups of the flour mixture to the creamed mixture and mix thoroughly. Add the reserved bourbon and the remainder of the flour mixture alternatively, ending with flour. Beat well after each addition. Beat egg whites until stiff but not dry; fold gently into cake batter. Add drained fruits and floured pecans to the cake batter; blend thoroughly. Grease loaf pans; line with wax paper. Grease and lightly flour wax paper. Pour cake batter into pan within 1 inch of the top. Place in a 275 degrees F. oven; bake loaf cakes for 2 to 2 ½ hours, or until a toothpick in the center of cakes come out clean. Cool cakes in pans on cake rack about 2 to 3 hours. Remove cakes from pans; peel off wax paper. Wrap cakes in cheesecloth saturated with bourbon; then wrap in aluminum foil or plastic wrap and store in a tightly covered container in the refrigerator for several weeks. Cut into thin slices to serve. 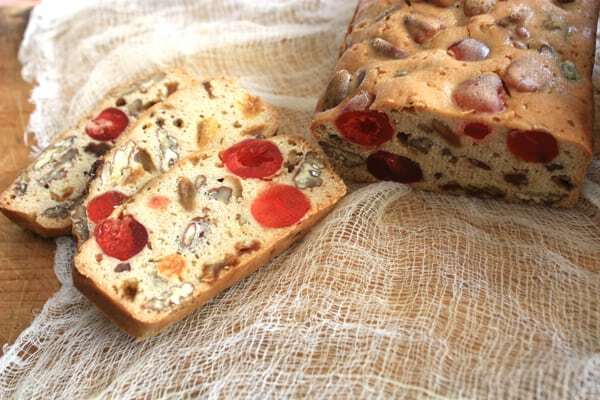 A beautiful Christmas bread. Thank you.